Porto-V – that’s the name of our newest baby in the Sessiondesk family. As with our studio tables, we have tried to combine a slim and timeless design with many well-thought-out functions on this speaker stand. At the very beginning, we asked ourselves: What is a good speaker stand? And why should we offer a separate stand solution when most of our studio tables already offer a surface for studio monitors? So who benefits from a professional speaker stand? The current Studioguide episode has the answers. 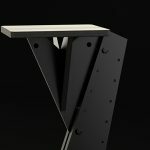 Of course, we are convinced that the Porto-V is the ultimate speaker stand for you. Finally, in our opinion, it offers everything you need for professional placement and alignment of your studio monitors. Before we go into the Porto V, however, there is a possible misunderstanding: The Porto-V is not a competitor, but a useful addition to our studio tables. While the Modularsystem has no extra surface for speakers due to its design, the top shelves of our BASIC series offer space for studio monitors of various sizes, but can also be used for other equipment – such as a laptop, an SPL meter and why not for a nice green plant? Nevertheless, also users of a GUSTAV, QUINTAV or OKTAV do benefit from a separate speaker stand. Do it like the pros? In nearly every studio forum you will find countless threads dealing with the question: Studio monitors on the surface of a desk – Yes or No? 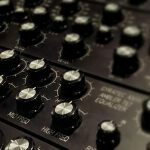 After all, there are enough photo examples from top studios around the world that have placed their additional near-field monitors upright or lying on an SSL or Neve console. So it can’t be that bad, right?! 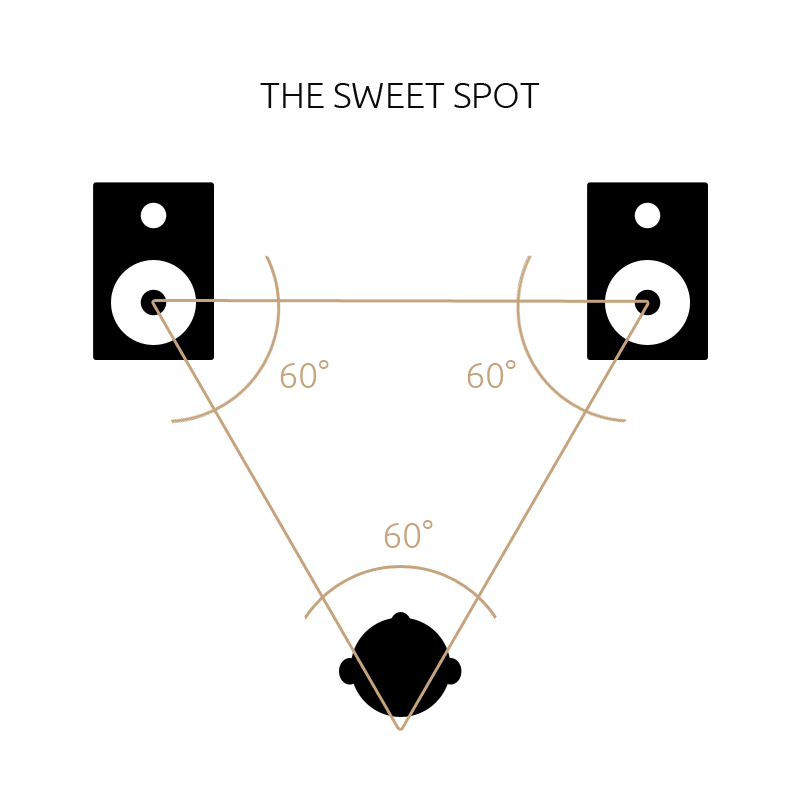 It isn’t – provided you follow a few basic rules when aligning the speakers. 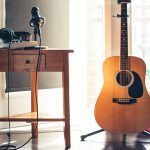 In our studio guide episode “Do I need a professional studio desk at all?” we have already listed these rules. Why should I still think about buying a separate speaker stand in this case? And what does the Porto-V offer in particular? With a speaker stand you can align your speakers much more precisely and flexible to your listening position (“sweet spot”) – in height, width, and angle. In addition, larger 2-way monitors from a woofer diameter of 8″ upwards, as well as 3-way systems, require a certain distance to the listener to be able to fully unfold their potential. At the same time, a professional speaker stand lets you adjust different models and sizes perfectly to your listening position – an advantage not offered by a fixed table. These tasks can be performed by almost every professional studio speaker stand. Then why should it be our Porto-V in particular? Same design, same surface materials, same quality – with the combination of a session desk and the Porto-V you get everything from one source. The base of the 25 kg tripod is an aluminum construction with a solid steel core, which guarantees maximum stability and minimized vibrations during your listening practice. 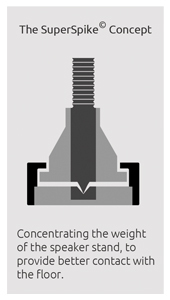 In addition, the Porto-V is made of POLIPLEX – a material that only we use. The combination of multiplex birch and polyurethane coating with a matte finish not only ensures enormous robustness and durability but also contributes to the elegant Porto-V design. To meet different requirements, you can flexibly adapt the head of the Porto-V to your listening environment. The height of the speaker surface can be adjusted from 82 cm to 124 cm at 6 cm intervals (the base construction offers an additional height fine adjustment of 15 mm). You can also adjust the tilt angle in two steps (3° and 5°) and rotate the speaker surface 90° to align your studio monitors horizontally. To prevent your expensive speakers from slipping, we have covered the head with a high-quality, non-slip polymer layer. A further advantage over placement on the studio table: signal and power cables can be routed via an integrated cable channel on the rear of the stand down to an opening in the Porto-V base. In this way, you avoid not only optically disturbing cables hanging downwards, but also potential dangers that can lead to damage to your speakers. Last but not least: With a professional tripod your monitors perform better and can show 100% of their potential. The keyword is “acoustic decoupling”. This prevents the sound energy of the speaker cabinet from causing the background to vibrate, which in turn affects the speaker system and reduces the precision of the sound reproduction. The Porto-V features SuperSpikes© from the Norwegian company Soundcare. Thanks to the excellent decoupling of the speaker stand from the ground, these spikes provide significantly improved low-frequency reproduction and transparency as well as reduced distortion. Fancy more episodes of the studio guide? Click here for an overview of all topics.